An updated version of the New International Version (NIV) has come out this year, and of course, controversy abounds. Few issues stir up evangelical Christian passions more than Bible translation. Knowing the reverence that Jews have for the Text, I was curious what opinion they’d have. What translation do they consider authoritative? What kind of debates have they gone through? You’d think they’d have a strong opinion about such a holy text. The Scriptures that they call their Bible are comprised of the same books as in the Protestant Old Testament. They often refer to it as the Tanakh, an acronym that comes from the three sections: the Torah, the Neviim (Prophets) and the Ketuvim (Writings). Jesus used similar divisions in Luke 24:44. Considering this question led me to a surprising observation. As much debate as I’ve heard among Jews, the one thing I’ve never encountered is an argument over which English Bible translation is the most authoritative. You simply never hear discussions analogous to the “KJV Only” controversy. For quite a while, I scratched my head over why this might be. Then I noticed something that showed that they take a completely different approach. Often when I’ve heard a rabbi discussing a Scripture text in a sermon, he’ll quote the line in Hebrew, and then follow with a rough equivalent of his own in English before expounding on the text. When I first heard this, I was shocked – how dare he translate the Bible himself! Why doesn’t he choose an authoritative English translation, and then follow its wording? The reason why is that Jews, historically, have studied the Bible in its original language. The public reading of the Hebrew Scriptures forms a large part of the synagogue service every week. When a rabbi quotes a line and translates it himself, his expectation seems to be that his listeners know enough Hebrew to check his wording on their own. The rabbi’s translation isn’t holy or authoritative. It’s just an approximation, a help to those who don’t know the language. Of course not everybody is fluent, but many people know the most significant words. Orthodox Jewish children start Hebrew school very young, and all the prayers are in Hebrew (at least in Orthodox and Conservative synagogues). The Jewish approach to the Scriptures reveres the original Hebrew text, because they know how difficult it is to render the Bible’s deepest meaning in another language. One ancient rabbinic comment was: “He who translates literally is a liar, and he who translates liberally is a blasphemer.” It’s extremely difficult to translate any text without distorting it, because Hebrew (as well as all languages) contains idioms and shades of meaning that don’t transfer well into other tongues. Of course our Christian tradition is to rely on translations. As we’ve taken the Gospel to the world, it’s not unreasonable that we’ve left the language work to experts. We’ve emphasized making the Bible accessible in our native tongue, rather than asking hearers to learn Hebrew and Greek. It’s a wonderful gift to be excused from years of language study before being able to meditate on God’s Word. Many of us (especially monolingual Americans, like me) can hardly imagine being asked to learn another language. One thing we should realize, though, is that our favorite English Bible version did not float down from heaven on a cloud. It’s the product of much scholarly effort, and many decisions by fallible (but prayerful) human beings. Many feel that the best way to study the Bible is to read it all alone, without any flawed human input. But if you’re reading a major English translation, you’re actually gleaning from the efforts of hundreds of interpreters who have worked together to render the Bible in a way you’ll understand. If you’re really curious to dig deeper, the answer is to start studying the biblical languages, as Jews have done over the ages, so that you can encounter God’s Word for yourself. For more on how translators decide to render the Bible’s Hebrew words in English, see my ebook, 5 Hebrew Words that Every Christian Should Know. *Two of the most widely read English translations of the Tanakh are by the Jewish Publication Society (JPS), and by Artscroll (Mesorah). Good thoughts as always, Lois. I will say that we can encounter God’s word in translations, even as scripture itself makes clear enough I think, when we consider that the very first translation of scripture (I think), the Septuagint, is quoted as the word of God in our Christian Bible, in the New Testament. Just a thought. Hi Lois. Could you give me the Talmudic reference for your quote above “literally…liar…” Thanks! What I am about to write is not my opinion. It is not my aim to debate or argue. Far from that. The Bible is a spiritual book. The thoughts that proceed from the words in It, are essential, absolute, pure and holy. The spiritual nature of the Bible can be experienced by the reader. Once an individual reads the Word of G_d, His Presence is surely manifested and revealed. G_d’s fluency is beyond human words. When the forefathers of the Judaic faith performed G_d’s instructions, I believe, obviously so, G_d the L_rd guided them. e.g. Abraham, Isaac,Jacob, Moses, Noah, etc. etc. The verity of the words, regardless of the unprecise terms used, do not tarnish the sanctity, the purity of the message of our L_rd G_d. It is the H_ly Spirit of G_d Who leads us into all truths, for when another or different term is put to use, maybe an inferior substitute given by translators, for as it could be the only matter or thing that can be grasped by the group of people which the translation is meant for, it doesn’t de-grade the Divine character or quality of the original. For it is on this dimension, one can finally, truly admit, the Original is Superior. Kevin, the author of the quote about translating literally/liberally is from Rabbi Judah (around 200 AD). It’s found in the Tosephta, Megilla 3:14 and quoted in the Talmud, Qiddushin 2:2. It’s debated as to whether this saying is an overstatement intended to warn translators of potential pitfalls, or to question the usefulness of using translated texts. I remember years ago being in a seminar with David Biven and someone asked “Which translation is the best and David said (if I remember correctly) “one translation is as good or as bad as the next” He then went on to explain that all translation hve their good points and thier weak points. His suggestion and solution? Study in the original languages! (He also recommended that until youu can do so to have several translations and learn to use the language study tools available). My comment is actually amiss, Lois. Sorry, I did not read the post well enough! I agree with David Bivin completely. The best way to study is to have several translations open so that you can compare them, and use the language tools available. Nowadays its very easy to do this with all the Bible study tools online. The issue isn’t really about flaws, but about the fact that words carry multiple shades of meaning which don’t often have an equivalent in another language. A translator must choose only one out of several possible ways to render a text. The very thought of trying to learn Hebrew or Greek used to strike fear into my heart. Then I discovered that even the very first words I learned started shedding light on my Bible study. My first book, Listening to the Language of the Bible, shares more about this. Lois, Thanks for your thoughts on this, and all those who left comments also. I can’t agree more that studying the original languages is the way to go. Quite a number of debates over technical issues in translation fade back into their proper place when studying the original languages. However, adequate study of the original languages requires years of study in both the original languages AND in linguistics – the study of how language works. Fortunately there is a great program out there that can get you quite far in a relatively short amount of time. There are likely other Biblical language study programs out there, but the courses taught at the Biblical Language Center in Israel are hard to beat. As a linguist and Bible translator in Africa who has struggled to learn four languages, I can say that it was by far the best language learning experience I have ever had. Amazingly, it can take complete beginners and within 4-6 weeks, you are reading complete stories in the Hebrew Bible (there is some pre-course work that contributes to this rapid acquisition). I would heartily recommend anyone with a desire to seriously study the Word of God, to consider learning Hebrew and/or Greek. Until you do you are relying on translations, and you will have to look at several from varying translation theories to have some of the understanding that comes from the knowledge of the original languages. Long live the study of the Bible in its original languages and cultures! Having “met” the Lord over 40 years ago, I still find myself hungrier than ever to get to know Him more. I’ve studied several languages, and I know the work I put into them! It would be wonderful if Hebrew came to me much easier than it is! I learned so much from our beloved Dwight Pryor, and in longing to learn more about “emunah”, I ran across your EXCELLENT article on the internet. I remembered that Dwight had recommended your material. Blessings to you! Thanks for your comments, Mary and Cameron. I also highly recommend the Biblical Language Center’s programs. I myself have studied Koine Greek there, as well as beginning and intermediate Hebrew. Their site is at biblicallanguagecenter.com. I work at an internet Bible company. The new NIV has caused quite a stir. I have found most people do not read the Bible they have be it NIV, KJV, NASB, NLT etc. I just heard someone tell them (mostly from pulpits) that the new version of NIV is gender neutral so they don’t like it. I think read what you can understand and keep digging deeper and G-D will give you more understanding. I personally do not and never have like the NIV but I do have one and use it in my studies some. I am a NASB or KJV fan. Having worked for years as a professional translator (Spanish to English) in the field of educational research, I can well appreciate the translator’s problems in attempting to render the true meaning in the target language. I have studied just a little of the Greek and Hebrew (the classes that were available to me at a local Bible school–enough to do word studies), and would like to learn more. Meanwhile, for study of the Holy Scriptures, I would never rely on just one translation, or even on just one language, if I could avoid it. At least, by comparing translations in the languages in which I am fluent or semi-fluent, I can have the benefit of others’ views of the text, plus what I can dig out from word studies, and thus can hope to come closer to the meaning of the original. That being said, I am much aware of the great great wealth enjoyed by those of us who have access to the Scritures, not only in various languages, but in various translations in those languages, while so many have little or nothing of the Word in their own native tongue. May we remember to be grateful to Him who has showered us with such riches! Evona, I couldn’t have said it better. Exactly, exactly. Readers benefit from the wealth of knowledge about the Bible text that translators contribute. I recently came upon your book, Walking in the Dust of Rabbi Jesus and I am loving it! What’s interesting is that I am faciliting a Bible Study on the Life of Jesus using several sources on the Harmony of the Gospels. I’m also using Hobbs’ Illustrated Life of Christ. I have recently started sharing insights from your book with the group. I was particularly intrigued by the chapter, The Treasure of the Text and that led me to wonder what scripture Christ read. I’ve done considerable research on that question and as with most topics, there are differences of opinions. My most current view is that Christ read the Tanakh with its three components: Torah, Neviim and Ketuvim. I’ve read that the Tanakh is often referred to as Mikra, that which was read orally. Could you let me know if you would agree that Jesus read this Hebrew canon and not the Greek version or Septuagint? Again, I can’t tell you how much I’ve enjoyed your bok; I plan on purchasing your previous book, Lisening o the Languge of the Bible. This article has the obvious answer that I have wondered. The issue of ambiguous translated text was frequently mentioned in my class called discipleship. Whenever it happens teacher RVL tries to show the visual examples and stories to make students understand. It would be very efficient and better way, if all the people in U.S. start learning Hebrew and read the bible in Hebrew, but it is basically impossible. In honest, as I am studying in states as an international student, I had had hard time understanding the true context and metaphors in bible when I was back in Korea. Korean translation bible was originally done by a french missionary who came to Korean dynasty around 18th century. The missionary learned Korean and succeeded to put the bible in Korean. However, the problem was that even though it was in Korean, it was too hard to understand for actual Korean people. The text is really awkward and the word used are quite ambiguous and even too random. When I came to U.S. and took some bible class, I felt that it is much easier to read bible in English. It is true that I had some difficulty to understand some words, but still. Now I wonder how would it affect my understanding of bible, if I am able to read the bible in Hebrew. If the English version, which is also figured to be not the best way to approach the real context, helped me that much, what about the original Hebrew bible as itself? These are some thought that came up in my mind after reading this article. Thank you for sharing the great article. As a KJV-only adherent, I don’t share the fundamental propositions asserted in this article. I believe that just as God used fallible men to record His word in the originals, he also used them to preserve them and at the same time transform them into one perfect English form. For that reason, I also reject modern versions such the NIV or NASB as they use a different underlying text and manifestly depart from the words given in 1611. For me personally it’s good to know that I don’t have to know Greek or Hebrew to have God’s word, even if conventional wisdom thinks I’m delusional. I just loved this article! It is exciting for me since my husband and I facilitate a Bible Study on the Life of Christ. We’re using several sources that provide the harmony of the Gospels. We’re also using The Illustrated Life by Hobbs. Since I have your book (a short time) I’ve purchased your first book and I continually make reference to these books during our discussions. You overlook the fact that the debate over the English Bible is overwhelmingly over the Greek Text upon which its NT portion is based. There is only one accepted Hebrew text for Orthodox and Conservative Jews, and that is the Masoretic Text. By Definition, Jews are MT-only. Anyone else is a Karaite or a Samaritan. 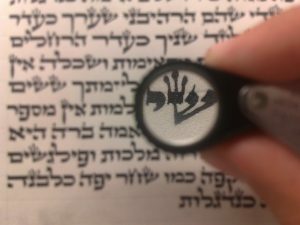 I just posted another blog on this topic, because I’ve finally heard a Jewish debate over a translation. A couple responses. David, there are thousands of other languages in the world – I’m not sure why English would be especially favored by God. Just started WALKING IN THE DUST…it is a wonderful read and (I’m reading the Kindle version) think I would wear out a highlighter if I were reading a paper version. You have a great “conversational” style that really makes it easy to follow your insights, your reasonings, etc. I like the way you come across as “Let me SHARE with you what I have learned…” as opposed to “THIS is the ONLY REAL meaning.” I am finishing up a correspondence course from Zola Levitt on Jewish-Christian studies. It too has been eye opening. He encourages students to visit a messianic congretation, to read additional Jewish background materials, and – if possible – make a tour to Israel. God has blessed me in that I have been able to do each of these. 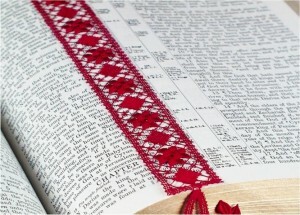 While readings require significant discernment and being a Berean (searching the Scriptures daily to see if these things are so), I have really been strengthened in my faith by going on this journey of understanding the Jewish roots of my faith and the Jewish Rabbi at whose feet – I believe – EVERY knee shall bow and EVERY tongue confess that JESUS is LORD! THANK YOU for your willingness to do the heavy lifting, to learn, and to share so effectively with your fellow believers. G_d Bless YOU! From my understanding there is only one Kosher English translation according to the Orthodox Jews — that is the Mesorah publications Tanach. I have also heard OJs condemn the JPS because of its founders’ affiliation with Reform Judaism. But ultimately, it is moot to most OJs because they read Hebrew. Thanks for your comment. I’m not surprised that the Orthodox don’t like JPS and its Reform background, and use the Mesorah Tanakh. But I’m guessing the Orthodox don’t quote the English words and see them as straight from God’s mouth. The issue isn’t as life or death when you understand that the real meaning is in Hebrew, not English.